Sutherland Plumbing – We’re Ready for You!! At Sutherland Plumbing we drive new, state-of-the-art, fully stocked trucks so we’re ready for you and all of your plumbing needs. Our trucks have stock of virtually everything needed to serve our valued customers. We even have brand new toilets in stock! This means that unlike some other plumbing companies who may have to run to the home improvement store – Sutherland Plumbing is ready for you!! 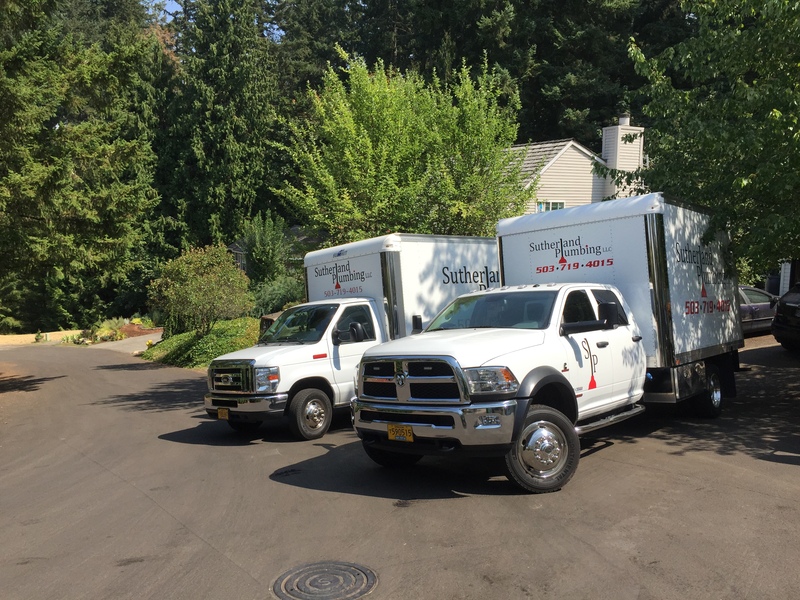 Two State-of-the-art Sutherland Plumbing trucks, fully stocked & ready for all of your plumbing needs! This entry was posted in Company Info, Sutherland Plumbing at Work and tagged Portland Plumber on August 27, 2015 by Ti Sutherland. Sutherland Plumbing approved for Apprenticeship Area 1 JATC! Sutherland Plumbing is a state approved training facility for plumbing Apprenticeship Area 1 JATC. The State of Oregon reached-out for photos and our very own Sean Anderson was picked twice for their album! This entry was posted in Company Info, Media Articles, Sutherland Plumbing at Work and tagged JATC, Portland Plumber, Sean Anderson on August 26, 2015 by Ti Sutherland. Text “PLUMBING” to “33133” for exclusive offers & discounts! Would you like to be among the first to know about exclusive plumbing offers and discounts? Simply text “PLUMBING” to “33133” to join our text message club. We’ll occasionally text you with exciting offers and discounts from your friends at Sutherland Plumbing! This entry was posted in Company Info, Special Offers and tagged Portland Plumber, Portland Plumbing Specials on August 24, 2015 by Ti Sutherland. Sutherland Plumbing – We Work Hard & Play Hard! Here’s one of our hard-working trucks taking a much needed break from the recent heat-waves! This entry was posted in Sutherland Plumbing at Play and tagged Contact Info, Family Company, Portland Plumber on August 5, 2015 by Ti Sutherland. Thank You Notes from Customers Say it Best! This entry was posted in Reviews & Testimonials and tagged Family Company, Portland Plumber, Portland Plumbing Review, Sutherland Plumbing Review on August 3, 2015 by Ti Sutherland.